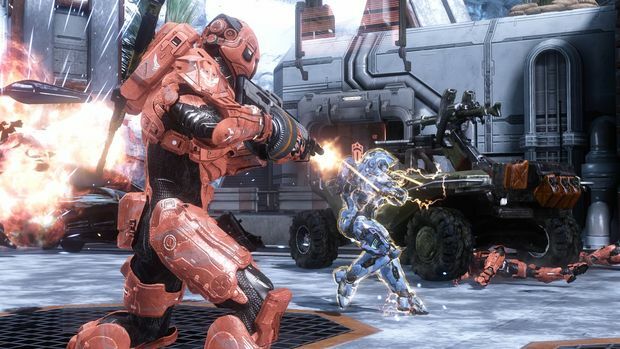 Halo 4 is officially out today and a lot has changed about the game now that it's in the safe hands of 343 Industries. Go read our review to learn what's new and improved! Multiplayer especially has seen a dramatic overhaul, making it a far more engaging and competitive experience. 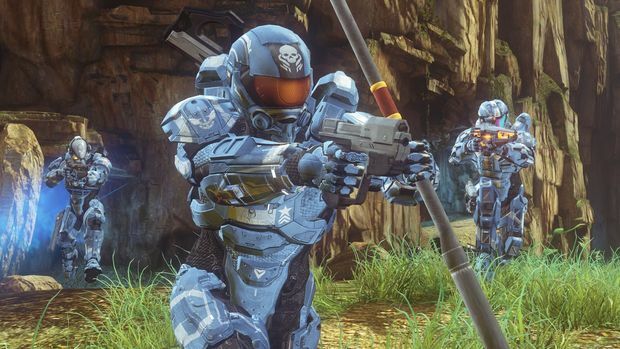 This is far from the end all guides you'll see out there, but I figured with all the changes, I'd give a nice and simple primer over a number of things you can expect in the multiplayer, particularly since some of the core elements from the past Halo games have changed. Obviously the biggest change -- other than everyone having the ability to sprint -- is the fully fleshed-out loadout system. That's right, now in a Halo game will you be able decide exactly what you want to spawn into a map with. On top of the default loadouts that everyone can select from with each spawn, you have five custom slots that you can trick out and decide which primary and secondary weapons, grenade type, Armor Ability, tactical package, and support upgrade to equip your SPARTAN-IVs with. 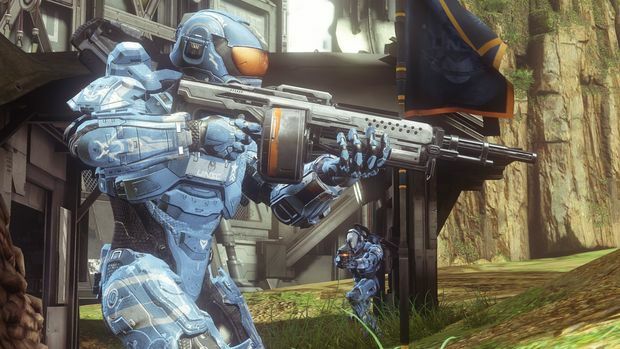 For your primary weapon, you can choose between the Assault Rifle, Battle Rifle, DMR, Storm Rifle, Covenant Carbine, Suppressor, and Lightrifle. For secondaries, you have the magnum, plasma pistol, and Boltshot. As for the grenade types, there's the trusty frag, the sticky plasma grenade, and the Promethean Pulse grenade. I'll expand more on all the weapons in the section below, but note that with the exception of the grenades, none of the primary and secondary weapons listed here spawn on the map at all in official game types. Jet Pack: Very small amount of time you can hover in the air, way shorter than what it was in Reach. Probably the weakest of the AA options. Hologram: One my favorites early on. Great way to trick enemies or to see if the coast is clear as it not only gives a visual cue, but it also appears on everyone's radar. Active Camouflage: Go invisible while standing still, or moving at a really slow pace. You gain some visibility if you move too fast. It no longer spoofs the radar -- instead, you see a few light-blue icons buzzing within the vicinity of where the invisible person is. Promethean Vision: Allows you to see enemy heat signature through hard surfaces. Very small use rate, but helpful to see what's just around the corner. Thruster Pack: Gives you a small burst of speed in whatever direction you're pointing at on the left stick. You don't gain a whole lot of distance though, and this seems to be the best used in the Flood gametype. Hardlight Shield: The evolution of Armor Lock. You generate a protective barrier of hard light in front of you, blocking attacks and bouncing off rockets. Still vulnerable from the sides or back. Autosentry: Produce a small sentry turret that hovers in the air and has an attack radio of 180 degrees from where it was spawned. Not the most powerful of attacks, but it's beneficial as cover fire, and helps weaken enemies' shields down when they're blindly rushing toward you. Especially great in objective gametypes. Regeneration Field: Releases a short-range energy field that heals up the player and teammates. These next two sections cover what can be equated to as Perks from the likes of Call of Duty. Once you've unlocked these features, you can equip one from each area on to your character. While it will make you think of CoD, these options are nowhere near as weighty. These mods are about making a difficult choice over stacking your character, and it's more about complementing different play styles out there. As it is, they're far from being game changers and they don't mess with the core experience. That said, it's still early on and it remains to be seen what things will be like when there are way more players out there in the higher levels using these perks. Shielding: Speeds up your armor's energy shield recharge rate. Resupply: Allows you to pick up grenades from fallen players. AA Efficiency: Increases the recharge rate for AA. Grenadier: Lets you spawn with more grenades than usual. Firepower: Lets you use a primary weapon for your secondary weapon slot. Fast Track: Allows you to advance in rank quicker. Requisition: Lets players choice a new set of choices when an ordnance is called in. Wheelman: Increase the long term durability of your vehicle and how it reacts to EMP charges. Ammo: Increases ammo capacity for both starting weapons and ordnance drops. Dexterity: Speeds up reloads and weapon swapping. Sensor: Increases motion sensor range. Awareness: You can see your motion radar while scoped in with a gun. Explosives: Increases blast radius of grenades and decreases the damage received. Ordnance Priority: Ordnance Priority offers more frequent ordnance drops to user. Stability: Steadies your weapon while being struck by incoming fire. Gunner: Increases how long before a mounted gun overheats and increases movement speed with detached turrets. Stealth: Dampens your footsteps, makes you harder to see on Promethean Vision, and increases your assassination speed. Nemesis: Marks enemy responsible for your last death. Drop Recon: Calls out ordnance drops in advance. 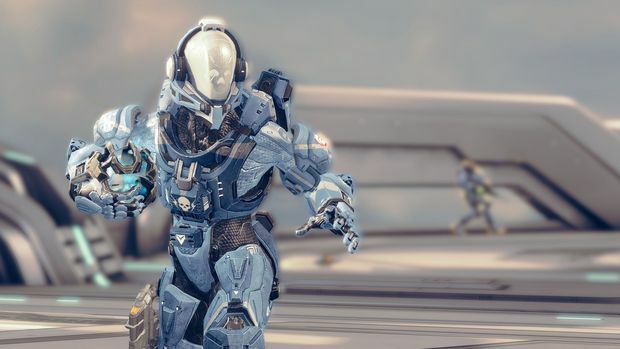 When you begin Halo 4, everything is locked with the multiplayer's loadout system and you'll first need to increase your Spartan Rank. There are multiple ways to rank up, with the core being the better you are in multiplayer, the faster you'll gain experience points. The progression system between Spartan Ops and War Games is linked as well, so completing the weekly episodic missions will help raise your rank. Like the multiplayer, the better you do against the AI, the better your results will be overall. And of course there are the daily, weekly, and now monthly challenges you can partake in to give yourself some rank boosts. You can now create custom challenges yourself too! You'll be able to make up challenges through Halo Waypoint, and people can even subscribe to your challenge feed. 343 will be monitoring this of course, as they don't want people abusing the system to make players rank up way faster than they should. Lastly, (as of the time of this writing at least) you can go stuff your face full with piles and piles of Doritos or Mountain Dew and use the XP codes to rank up faster. Side effects include the early onset of type II diabetes, and gross, grease-stained Xbox 360 controllers. Like I said, you'll unlock stuff as you progress, but there's a catch. What you're unlocking is the right to purchase equipment. 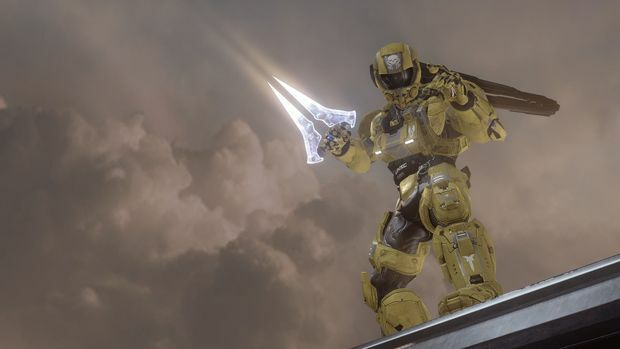 You're earning money called Spartan Points as you raise your Spartan Rank, and those points go to being able to purchase weapons and abilities. One of the very first things you unlock are the Battle Rifle and DMR, but you're not being given both guns. Rather, you have to buy one of the guns with Spartan Points. Everything has different costs, and eventually you'll have earned enough money to buy everything. There's a bunch of cosmetic items you'll be able to get too, and all of that content is just gated by your rank, meaning you won't have to spend any of your points for it. There's a staggering amount of different armor and emblems available for player, all of which can be mixed and matched. 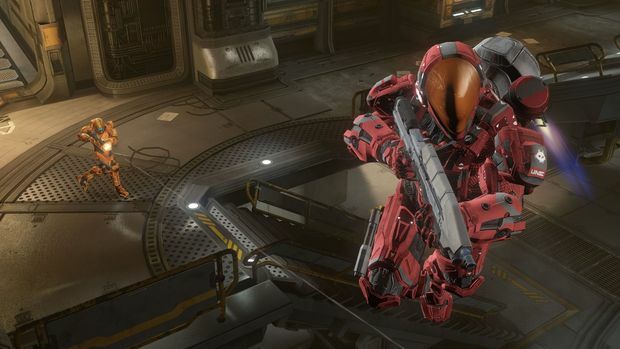 Another big change to Halo multiplayer is the way the weapon spawns work. At the start of the match, you'll be able to see on your HUD what exact weapon is available and where it's located on the map. More weapons will eventually drop in, and they typically consist of the higher-tier power weapons. There's a different rotation of weapons that spawn in, and it scales based on what the map is. 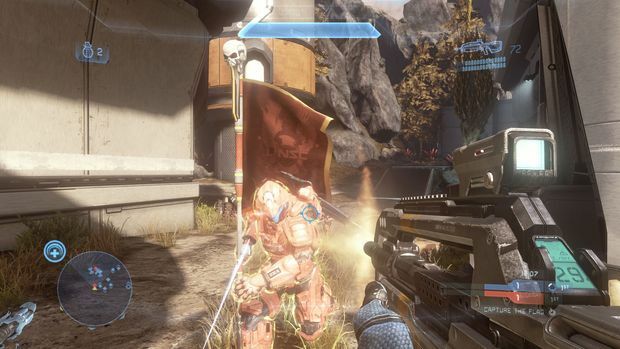 For instance, you can expect the Spartan Laser when it's a map full of vehicles. On top of map-specific ordnance system are personal ordnance system where players can summon a weapons drop. Players are earning points on top of the points dedicated to the scoreboard, and those points go towards filling up a meter. Once that meter is filled, you'll have the option to call in either more grenades, a new powerful weapon, or a player trait power-up that consist of either a shield, damage, or speed boost. Players that are doing exceptionally well should be able to call in around three ordnance drops on average. 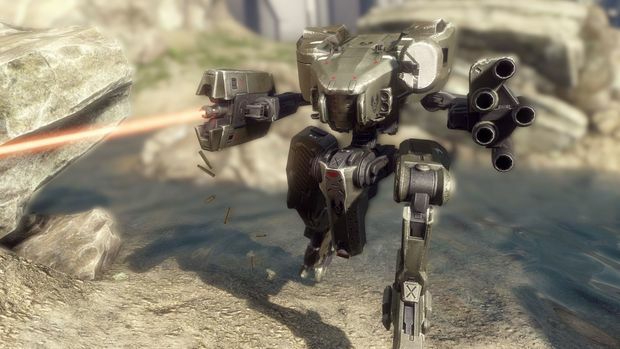 On the human side, you have the magnum, Assault Rifle, Battle Rifle, DMR, shotgun, sniper rifle, rocket launcher, Sticky Detonator, SAW, Railgun, Spartan Laser, and frag grenades. The Sticky Detonator is essentially a mini-grenade launcher that will stick to any surface. Once stuck, you just need to pull the trigger again to detonate. It's a very hard weapon to aim precisely, but worth if for the punch it packs. The SAW is a machine gun with a high rate of fire, and will shred anyone up very quickly. The Railgun packs the punch of the rocket launcher, but you need to hold down the trigger to charge it up first before firing. The really important weapons are the Assault Rifle, Battle Rifle, and DMR since those are the main loudout weaponry you'll get starting off. Both the AR and DMR have bloom, which means that the faster you shoot the gun the less accurate it is. Don't let that scare you -- bloom has been tuned down dramatically here. It's not as bad as it was in Reach before the title update. With the AR, best practice is to feather the trigger so you shoot in bursts at targets in a medium distance. Of course, do hold the trigger down when targets are in close range. The DMR is a deadly beast, and a few well placed head shots will take enemies down. It's a great long-range weapon, and pretty effective at medium range. There's no recoil either, so I wouldn't recommend scoping unless it's a long-distance target. With the Battle Rifle, it's a three-round burst that doesn't factor in bloom but it does have a little more spread to it. The main drawback with the gun is that it recoils so you have to be constantly adjusting your aim as you fire. On the Covenant side, you have the Plasma Pistol, Storm Rifle, Covenant Carbine, Needler, Beam Rifle, Energy Sword, Fuel Rod Cannon, Gravity Hammer, Concussion Rifle, and plasma grenades. All the guns are pretty parallel to the human weapons for the most part, but I've found myself largely sticking to the human weapons. The biggest change with any of them is the Plasma Pistol, as it has less ammo, eats up energy faster when you hold down the trigger, and it's harder to track targets now too. The Promethean weapons consist of the Boltshot, Lightrifle, Suppressor, Scattershot, Binary Rifle, Incineration Cannon, and Pulse Grenade. The Boltshot is like a pistol, and it's secondary lets you hold down the trigger to build up a shotgun-like blast. The Lightrifle, is a mix between the BR and DMR, as it fires three-rounds normally, or one shot when you're scoped in. 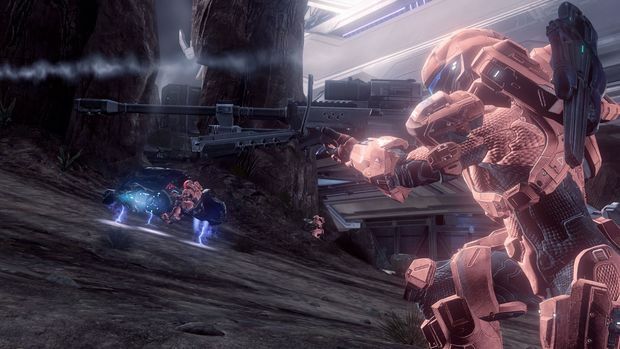 The Binary Rifle and Incineration Cannon are both powerful sniper rifles and rocket launchers, respectively, but they have very small rounds and take a bit to reload. Lastly on the weapon front is the trusty melee attack. Bleed through is back, so the damage you inflict when there's still some shielding left on someone carries over, taking out the remaining shielding plus inflicting some serious pain. You can't simply rush towards a player anymore though, as you will be slowed down slightly when taking enemy fire. Plus, melee doesn't really have big reach anymore. Melee hits to someone's back is an insta-kill of course, and holding down the melee when striking someone from the back will see your character perform a cool assassination attack. You are vulnerable while doing an assassination since you can't break from the animation. 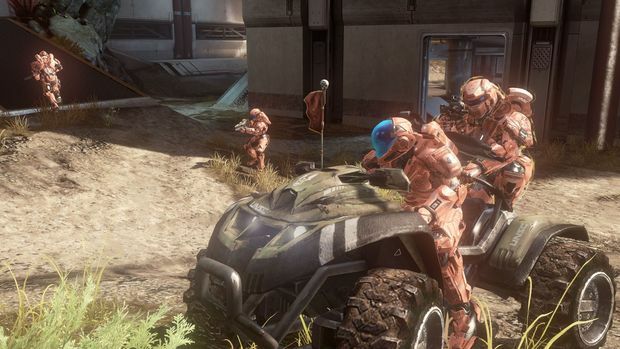 Warthogs with the chaingun, rocket launchers, and Gauss are all back, as are the Scorpion, Ghost, Wraith, and Banshee. Vehicles have a little more health to them compared to Reach, but they can all still be taken out fast with a coordinated focused attack by a team. The newest addition to the vehicles is the Mantis, a walking bi-pedal mech that has a powerful stomp attack, chaingun, and a five barreled rocket launcher. It also has it's own shielding system, but it takes a long time before it recharges. Vehicles are only as good as the team you're on, and a well communicated team will have designated players that support vehicles by nabbing all the power weapons before the other team. There are 13 maps on disc, but only 10 will be used in the official game matches at first. The three other maps are all Forge World locations, and will eventually get rotated in. There are also only nine game modes to play on, but like the Forge maps, more modes will be added over time. In terms of straight up deathmatch style games, there's Infinity Slayer, Big Team Infinity Slayer, and Team Slayer Pro. The main difference here, besides the player capacity, is that Team Slayer Pro doesn't allow the use of personal ordnance drops. There are some other restrictions with Pro mode too, such as no radar, and a set loadout system that's equal for everyone. Regicide also falls under the deathmatch category, and is a six player free for all mode. The twist here is that the player with the most kills is the King, and the more kills the King gets the higher his bounty increases. The King will also be given random bonuses based on how long they've held the crown, and all the other players can see where the King is at all times on their HUD and radar. Objective modes consist of Flood, Capture the Flag, Oddball, and King of the Hill. Dominion sees teams of six vs six capturing and fortifying three different bases on the map. The longer a team holds a base, the more perks they're granted such as auto cannons, vehicles, and weapon resupplies. If one team manages to capture all three bases, the opposite team will then all be marked on the radar/HUD, and won't be able to respawn. The opposing team must recapture at least one base to be able to respawn back in, plus they're all given overshields during this period. Capture the Flag has changed so that the flag carrier can wield a more powerful magnum at the same time. The biggest catch now is that everyone can see where both flags are at all time. No more sneaking around! With Oddball, and Grifball, players can now toss the ball to pass to other teammates. Flood (previously known as Infection) sees a team of humans surviving against players infested as the Flood. King of the Hill is largely the same as it was before. The last thing to touch on is the matchmaking in that you're now able to join matches in progress. No longer do you have to wait ridiculously long to get a match going, nor will you be stuck on an uneven team getting decimated by the fully stacked team. So there's your simple little look at all the major elements of multiplayer. There's a lot to talk about though, so if you have any questions just leave them in the comments and I'll jump in with answers! Otherwise let's play a round. 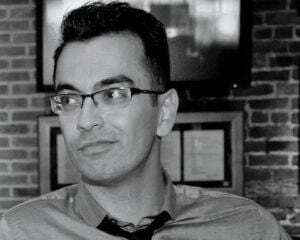 My Gamertag is Dtoid CTZ.